Whew. 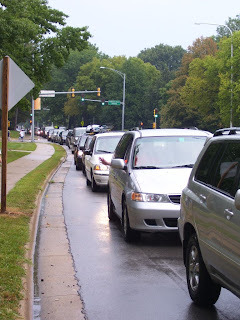 I guess with it being Labor Day weekend and school starting and all, summer really is over, but what a summer - attendance at the Market was up, all that rain at the beginning was so crazy, once the produce got going it went gangbusters, etc. Our twin towns are full of people once again, though, and that means folks - especially new residents - are going to be looking for something to do that's busy, fun, and involving food. Market at the Square, duh. Sweet Corn. We can see the end of the season from here, but in the meantime you must come out and avail yourself of a for-now plentiful sweet corn supply. Two major vendors I spoke with are planning on bringing large loads, so there should be plenty, even for the late crowd. Sick of eating it (is such a thing possible?)? Boil it, cut it off the cob, and freeze it in freezer bags. It tastes wicked good in January. The season's last Moo Mobile. If you haven't tried the homemade ice cream from the Sidney Dairy Barn's Moo Mobile, this is the weekend to give it a shot, because after this Saturday, they're gone from the Market until next year. The chocolate is my fave, and the ice cream sandwiches have been a huge hit with the younger set. The Moo Mobile is in row five - you can't miss it. Bagels and granola. It's not easy to find a good bagel in this town lately, but if you're not above toasting your own, Stewart's bagels will make you happy, indeed. Their granola/granola bars are powerfully good, too. They're also in row five, but they're only at the Market every other week. Rain barrels. It's been unspeakably dry here for weeks - which, considering how wet it was earlier this year, seems to be a particularly cruel joke - and the water rates are going up, up, up. Maybe it's time to invest in one of these? If you visit Austin and Sarah, whose booth is in row 4 at the south end, they'll tell you how the barrels work and give you testimonials from local folks who've installed them and use them. Weather forecast from the WILL guys is looking positive. Hopefully we'll see you there! One more thing - I need some feedback. 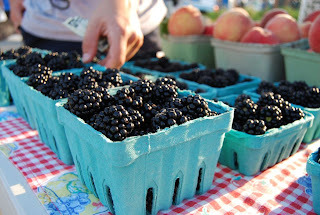 What do wish you could find at the Market that you've seen at other markets? Leave a comment or email me. Thanks! Takes photos at the Market. No, not the poltergeists - the students! The University of Illinois students are back (or, in the case of freshmen, are here for the first time)! Official Move-In Day was yesterday; Townie Summer is OVAH. The Urbana Sweet Corn Festival is getting started Friday evening and will go all day and well into the evening Saturday in downtown Urbana. There'll be tons of food, (not just corn), kids' activities, art and craft vendors, an auto show, and FOGHAT, people. Foghat takes the main stage on Saturday night at 9 PM. You've heard them - "slow ride/take it easy". Rock n Roll! 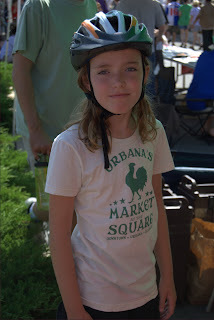 Urbana's Market at the Square sashays into its 16th week. We'll have a little of some things (we're at the end of berries and nearing the end of peaches, apples are starting to come in, come early for salad mixes) and a lot of others (still plenty of sweet corn, natch, and tomatoes are coming on strong) and tons in between. 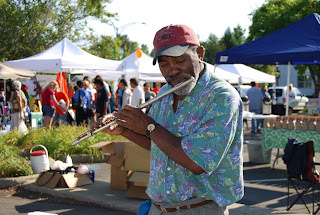 If the weather holds we'll have plenty of music (listen for Rodney George Peacock's awesome flute if you come early!). Just a quick note - Meister's Gluten-Free Mixtures and Baked Goods will be at the Market this weekend. These folks are proof positive that gluten-free pastries and other yummies, done right, taste AWESOME. Go visit them at the south end of Row Four! WILL-AM weather forecast: Looks like the rain will hold off until late afternoon. See you guys there - I'm the one with the ponytail running around. Say hi! As a market manager, I love it when one of the Market's produce vendors diversifies - when they add a little something to their repertoire that differentiates them from other growers. Going organic is an example; so is offering heritage turkeys for the holiday season, or growing varieties of fruits or vegetables that no one else is. 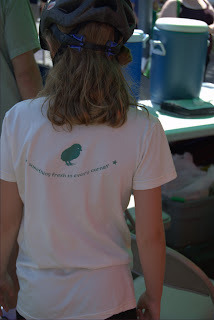 All of our vendors have a lot to offer and try hard to do something different each season. This year, Prairie Fruits Farm & Creamery (north end of Row Four) are diversifying their already-unique operation (they're the first farmstead cheesemaking facility in Illinois; farmstead means that they only use the milk produced from their goats to make their cheeses) by offering "Dinners on the Farm". ... is that you also get to eat food sourced directly FROM their farm, or darn close. 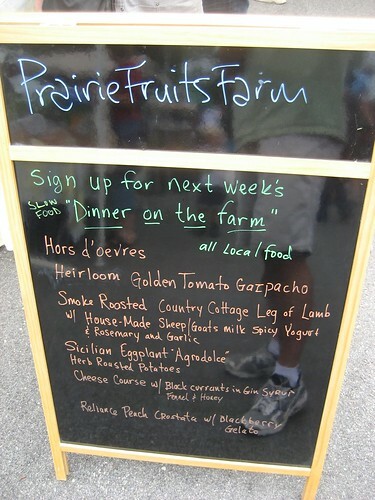 It's not just goats and goat cheese at Prairie Fruits, you see - they grow many varieties of several fruits, keep a good-size vegetable garden, and are friendly with people who produce what they don't - meat and certain vegetables. Prairie Fruits employs Culinary Institute of America-trained Chef Alisa DeMarco to preside over the cooking for these dinners. I can tell you from personal experience that the meal is divine - un-fussy but of the highest quality in terms of taste and preparation - and the experience as a whole is terrific. It's dinner the way most of us never eat any more. You're dining al fresco, you bring your own wine, you have conversation during and between courses; you're "having dinner" for a few HOURS. 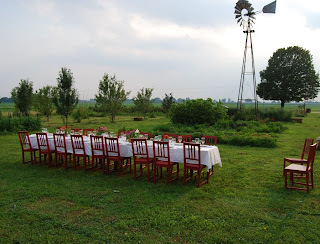 The next dinner on the farm will be this Saturday, August 16. Space is limited to 40 (please call Leslie at 217-643-2314 to see if the dinner is sold out), and cost is $65/person for 5 courses. Guests are asked to arrive at 4 PM for hors d'oeuvres and drinks, with dinner beginning at 5 PM and lasting until about 8 PM. See menu in photo above for details. If it is sold out? Not to worry. There'll be several more dinners on the farm this fall. *****EDITED TO ADD:***** It looks like August 16 is sold out. Prairie Fruits Farm & Creamery updated its website overnight (looks fantastic! ), and you can now reserve places for the other dinners here. .... but there's a little video about the Market you can watch. Thanks, UPTV! Sorry about the hiatus - I've been working hard, I swear. The back says, "Something fresh in every corner" and has a little chick on it. Aw! Then I worked with a SuperVolunteer (tm)/U of I dietetics student named Jen Hewitt to develop Sprouts at the Market - Market programming geared toward kids. The first session is this Saturday, August 9. 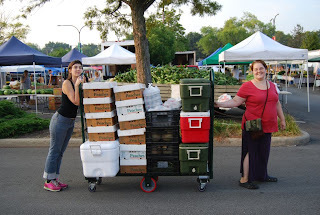 There's a little nutrition lesson involved, and a little meet-your-farmer exercise, and a tour of the Market, and some produce sampling at the end. It's a great way to make trying fruits and vegetables fun for the sprouts among us. If you're interested in bringing your 5-12 year-old to the Market to participate, please come to the City tent at either 9 AM or 10:30 AM to catch one of the tours. After each tour, every participating child will receive a sample pack of donated yummies from participating vendors. Come early to make sure you get a spot! If you have any questions, please call 217-384-2319, or email me. Here's another cool happening at the Market this weekend - the guys at the southeast corner of the Market - Papa George (prepared Greek and other foods), Pasta Alley (handmade pastas and sauces) and Roth Countryside Produce (fresh produce from Morton, IL) have combined forces for their own sample event - George is making food from Roth's produce and Pasta Alley for people to try at the Market. YUM. These guys are at one end of Row Five - living proof that it pays to shop all five rows! The weather looks splendid, according to those wonderful meteorologists over at WILL-AM. I really, really love them when a) they forecast scrumptious weather and b) they're right about it.